All transactions are safe and secure with a reliable history in online purchasing behind each of our associates. 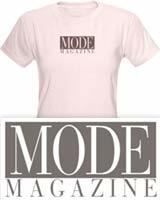 Buy the MODE Magazine t-shirt to own Ugly Betty clothing and merchandise. Show everyone that you're a fan of Mode Magazine with this stylish Mode t-shirt. The design features a grey block on the front of the tee that contains the word "Mode" printed in white capital letters. Underneath the rectangle is the word "Magazine" printed in grey capitals. This shirt will let your friends know that you're an expert on the latest trends in the New York City fashion industry. It will also let them know that you're a fan of the America Ferrera Ugly Betty TV show on ABC. Match it with a Mode hat. In addition to the MODE Magazine tee above, browse the Ugly Betty Clothing Gallery for more apparel like men's and women's clothes, kids shirts or hoodies.